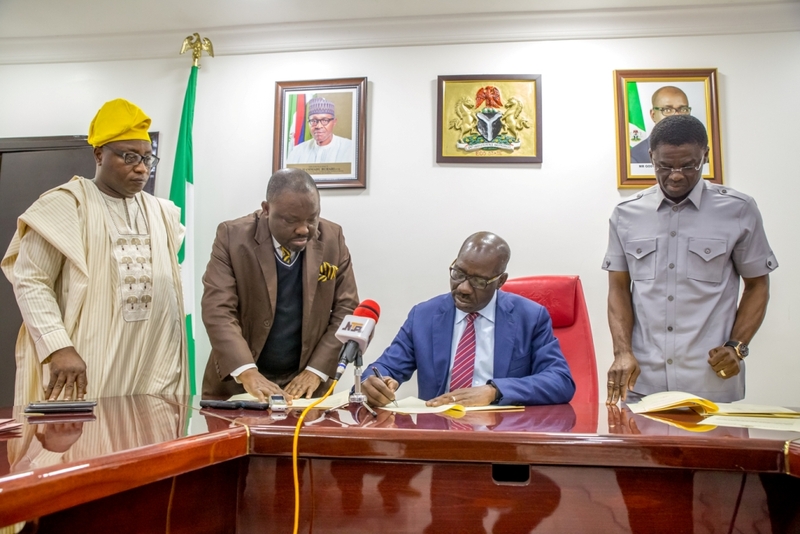 Edo state Governor, Mr. Godwin Obaseki on Wednesday gave assent to the State’s Uniform and Harmonized Levies, Rates, Fees and Charges Collected by Local Government Law 2017. The bill was passed by the Edo House of Assembly on Tuesday. Obaseki said that the law would enable the state and local governments capture and access revenues accruable to them. He said that a special schedule would be created where taxes collected by the various Local Government would be announced to enable the tax payers see transparency in the tax collection process. He said the review of the bill became necessary in pursuant of his New Year Day Broadcast to discourage levies and taxes being collected by unauthorized persons in the state. The governor who thanked the Speaker added that the harmonization and the uniformity of the levies and taxes would not have been made possible without the cooperation and commitment of members of the House. He assured members of the introduction of cashless mechanism to ensure that the collection of all levies and rates were carried out by way of electronic means. Responding, the Speaker of the Assembly, Hon. Justine Okonobor said the action of the governor in ensuring accountability and transparency in taxes and levies collection in the state was a welcome development. He, however, appealed the people of the state to abide by the charges Law as soon as its enforcement commenced.